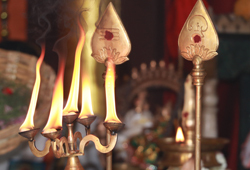 AstroVed will be performing a 6-priest grand fire prayer chanting the Subramanya Moola Mantra Stavam invoking the protective blessings of Lord Muruga on the first day of his 6 power days. 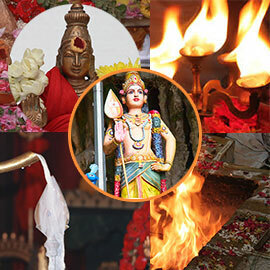 Performing Shatrusamhara homa by offering 6 different flowers, fruits and food offerings (Nivedhyam) invokes Lord Subramanya as the destroyer of demons. At the Swamimalai Powerspot, Muruga explained the meaning of the Pranava mantra ‘Om’ to his father, Lord Shiva. 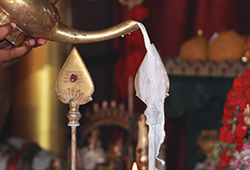 As per the Powerspot practice, performing Abishekam with milk to Lord Muruga at Swamimalai Powerspot can remove obstacles, bestow prosperity, and solve all life problems. 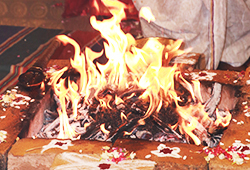 You will receive the sacred grey ash powder from the homa, which will be blessed in the rituals. Keep this on your meditation altar and wear it on your forehead during meditation or at other times to expand the Divine blessings into your life. 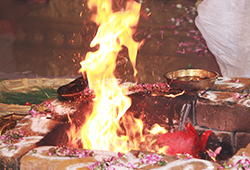 Book your individual Kukuta Homa during the power time of Skanda Shasti. 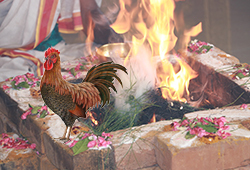 This sacred fire prayer to the rooster, Lord Muruga’s powerful emblem of his flag, can destroy the negative elements in your life that keep you lethargic, unmotivated and trapped in debt, relationships and poor health. 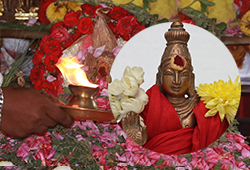 Book your individual Sri Subramanya Moola Mantra Stavam Homa (Muruga Seed Sound Blessings Fire Prayer) during the power time of Skanda Shasti. 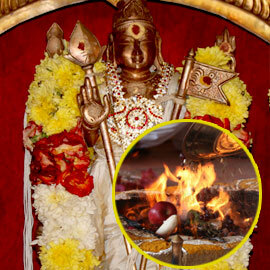 As per the sacred text Kumara Tantroktam, performing Subramanya Moola Mantra Stavam Homa can bless with Ashta Aishwaryam (8 kinds of wealth), eliminate enemies, cure diseases, and bestow wisdom, prosperity, and salvation. 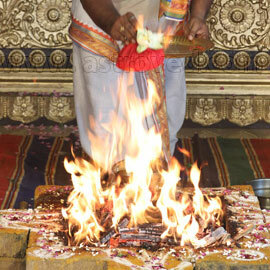 Book your individual Shatrusamhara Homa (Victory over Enemies Fire Prayer) during the power time of Skanda Shasti. 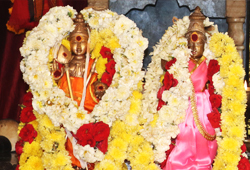 As per the traditional Shaktham system of worship, performing Shatrusamhara Homa can invoke the blessings of Lord Muruga as the vanquisher of demons to avert unwanted troubles, overpower enemies and overcome debts. Get your Coral Rudraksha combo bracelet with silver string, which will be energized in the Skanda Shasti ceremonies to connect with Muruga’s supreme wisdom to succeed in your endeavors. You will receive the energized product, which will be blessed in the rituals. Keep this on your meditation altar and wear it on your forehead during meditation or at other times to expand the Divine blessings into your life. Please Note: Your energized product will be shipped from Chennai, Tamil Nadu. Please allow 2 – 4 weeks for delivery after the entire set of rituals is performed. 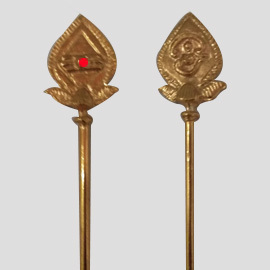 Get your 5-Metal Vetri Vel With Stand And Coral Bead, which will be energized in the Skanda Shasti ceremonies to connect with Muruga and defeat the negative and unhealthy energy of debts, diseases, legal issues, enemies and bad karma.